The Tarvin newsletter began as a mimeographed letter from Sarah Tarvin to a number of relatives with the goal of organizing the family and publishing a book of Tarvin descendants. When the Tarvin Family Association was organized, the newsletter adopted the name LifeLine and has been published two to four times a year ever since. For members joining recently, here is an historical archive of Tarviniana, scanned as PDF documents. Note: many order forms in these early newsletters carry outdated addresses. 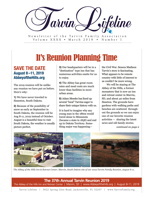 For the latest contact information, please see the Tarvin Family Association website. Click on the logo above to go "home." These documents are all copyright by the Tarvin Family Association. Please do not copy or repost them elsewhere. They are hidden from search engines in a password protected area. To view a document, click on its link below. Note: The following documents are in Portable Document Format (PDF). To view them, you must have a PDF viewer installed, such as Adobe Reader or Apple Preview. (Some browsers, such as Google Chrome, don't need special programs to read PDF files.) If you need to install a PDF viewer, click here to download the free Adobe Reader.